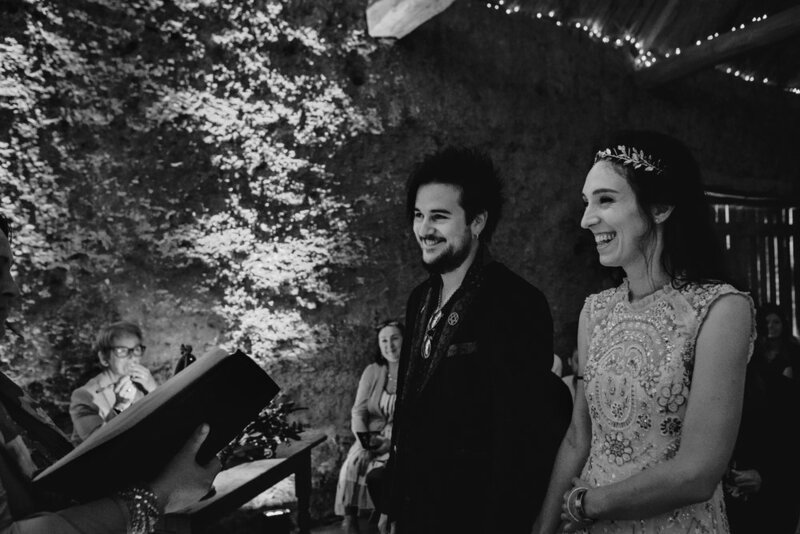 Nancy and Eden got married in July at the gorgeous, relaxed and rustic venue of Higher Eggbeer Farm in Exerter. Both are creative people; Nancy is a Graphic Designer, and Eden Gallup is a musician and bass tech for the band, The Cure. 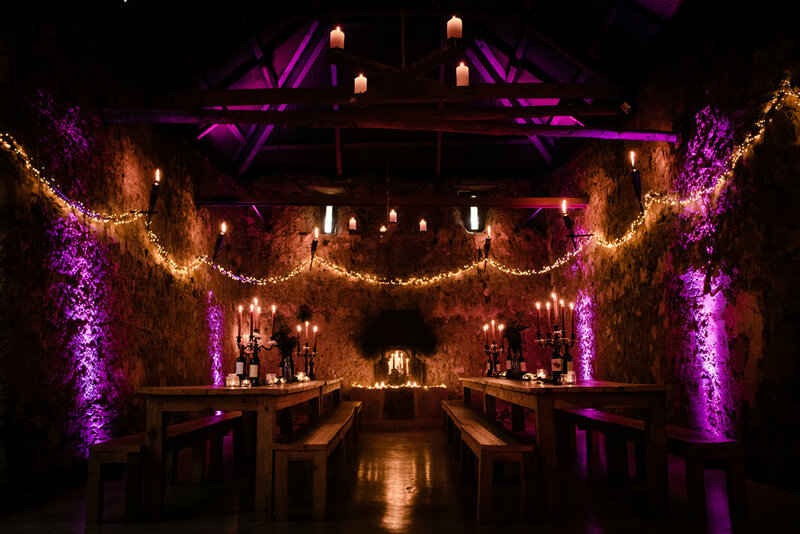 The wedding was held by candlelight in the beautiful ancient barn surrounded by family and friends. 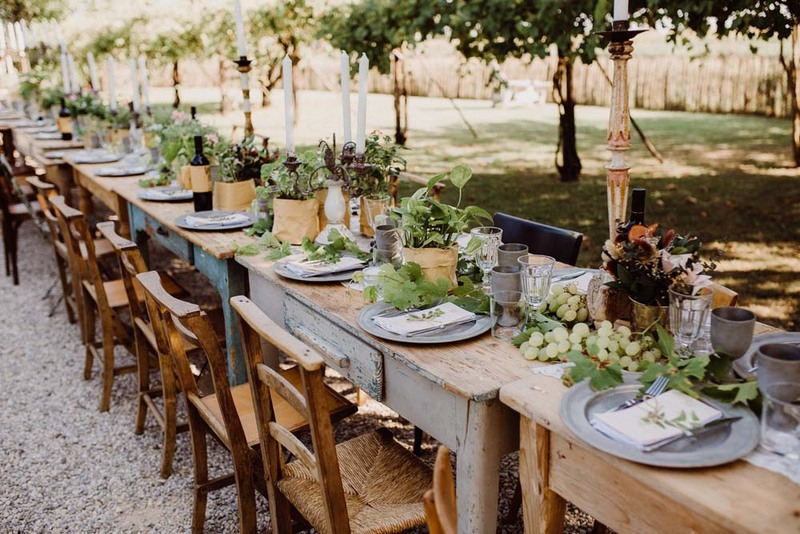 Nancy was very clear about what she wanted visually and they chose a stunning colour palete that included teal blues, dark burgundies, burnt orange and amethyst with hints of peppermint green and dusty rose pinks. Nancy’s flower bouquet included wild roses and grasses, seed pods, eucalyptus and berries and now takes pride of place in their home.. Thank you Nancy and Eden for choosing the Sleeping Flower Company to be a part of your amazing day! 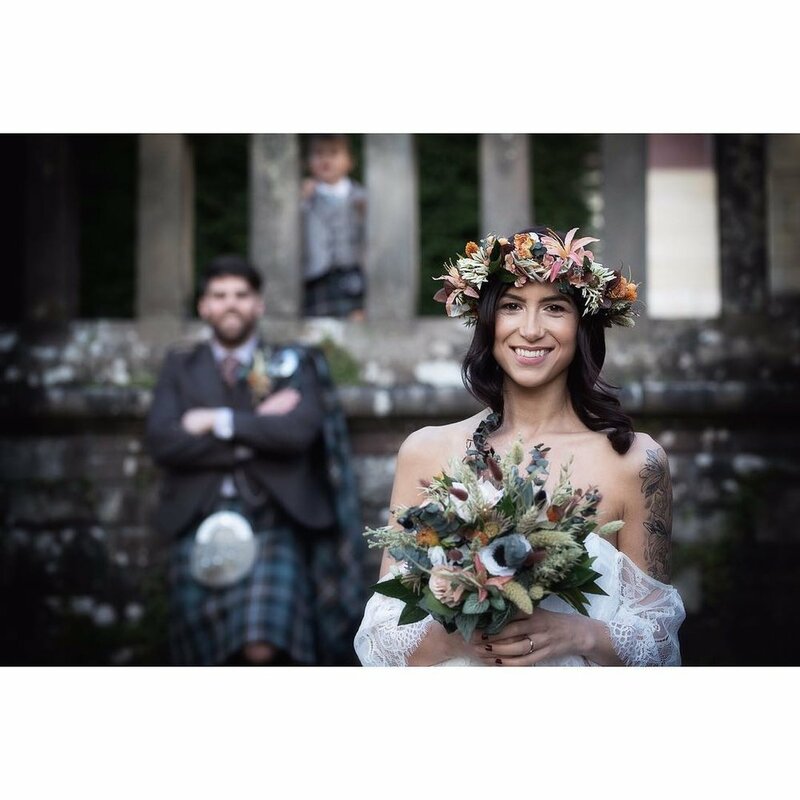 Sophie and Sam got married on the 23rd of June 2018 at Pitcalzean House in the spectacular Scottish Highlands. They spent a colourful, relaxed, party style weekend with family and close frinds that included a pub quiz, a game of ‘Rockband’ and an Ice-cream van!! The whole day was relaxed and just perfect - no stress and the opportunity to enjoy every second! To add a special touch to the ceremony, Sophie and Sam held a hand fastening ceremony, using a Mitchell tartan scarf bought by Sophie’s late Nan. This added a really special touch to their big day. 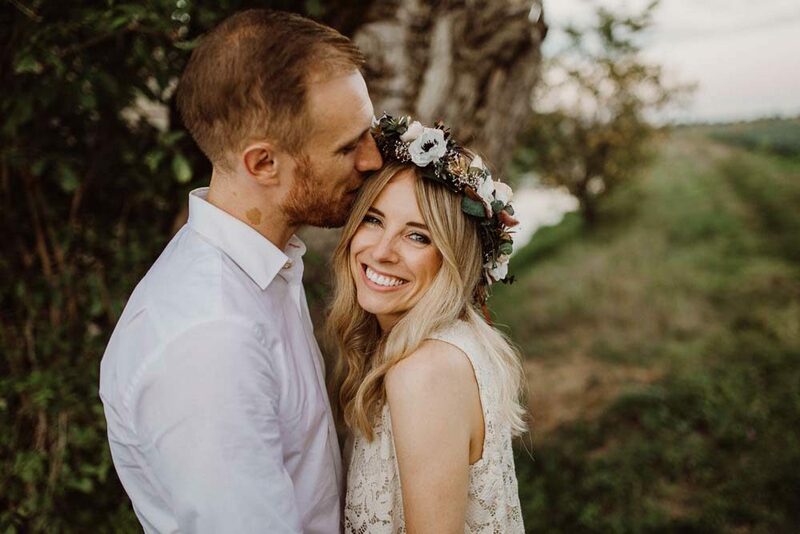 Congratulations Sophie and Sam from the Sleeping Flower Company… and a big-thank you for choosing us to share in your special day! 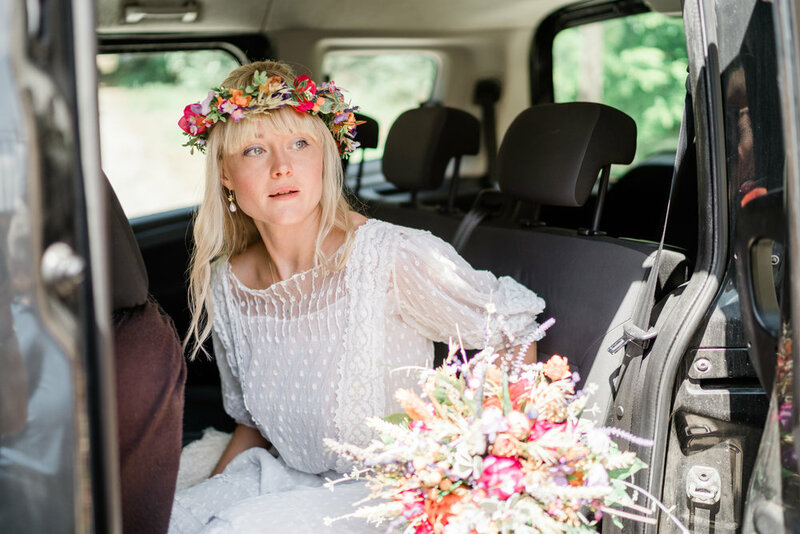 She certainly pulled that one off and the Sleeping Flower Company enjoyed every minute of being part of something amazingly creative and different. Thanks for asking us! "Julie! 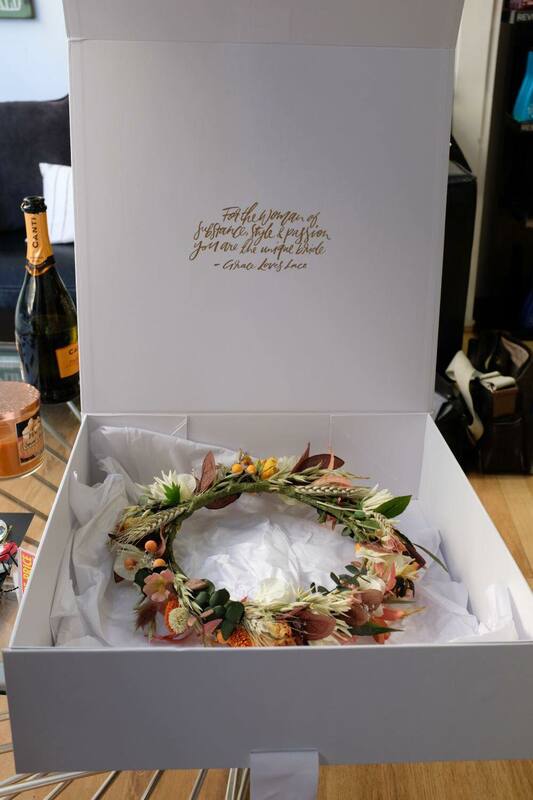 Wow, Thank-you so much for making my beautiful flower crown, bouquets and button holes." " They were more amazing then I ever could imagine. Everyone has said how gorgeous they were. I can't thank you enough for being a part of making my day perfect." 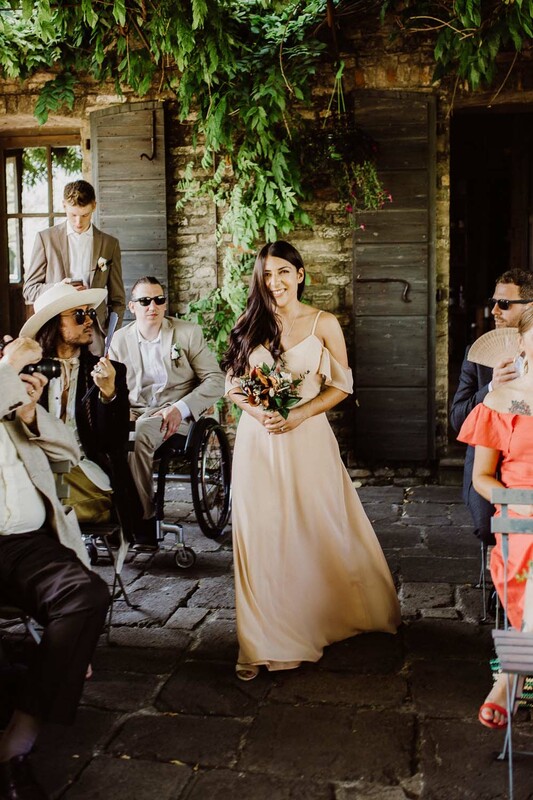 We think she looks amazing! Thank you Faye and Joe for being Sleeping Flower customers!
" I'd like to think I was an integral part in setting up the Sleeping Flower Company! Thank you so much Mum for our amazing wedding flowers!" What an amazing day at Lumley Castle, County Durham! It couldn’t have been a more wonderful setting or a more spectacular day! The magnificent castle backdrop and stunning grounds made it the perfect place for getting married. The bride ( my wonderful daughter!) 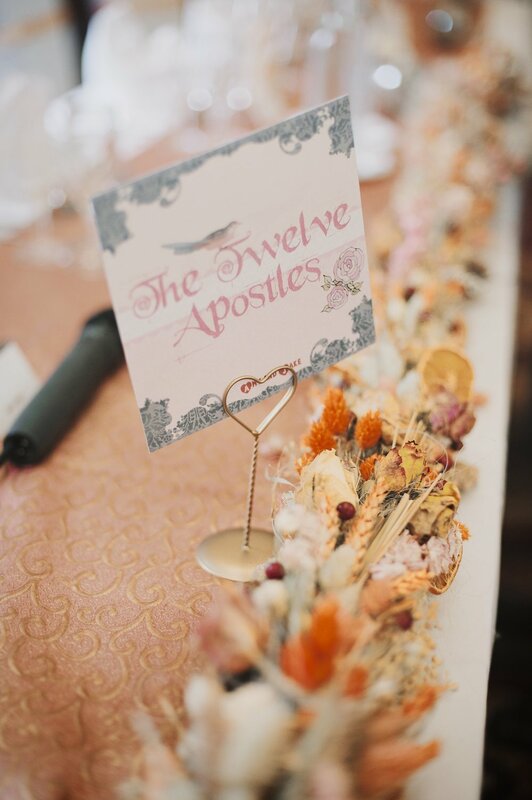 was dressed in a stunning Farage, Paris, wedding gown and chose an antique soft peach and pink palette with hints of deep orange and gold for her wedding flowers. 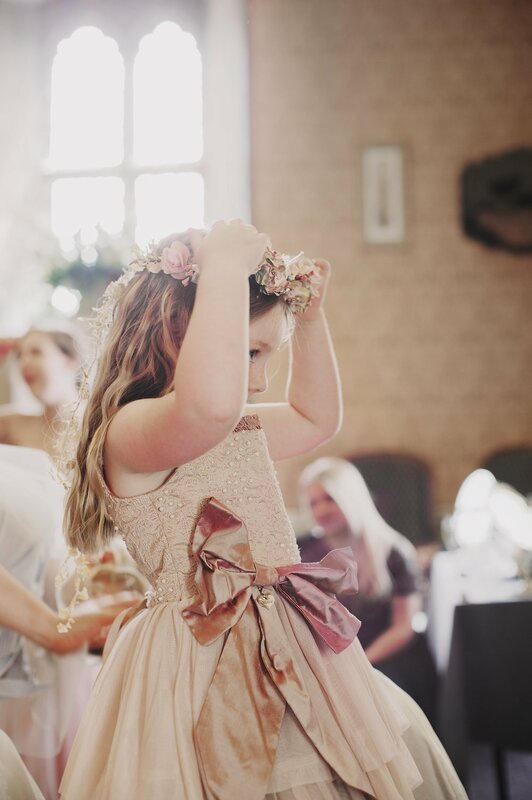 The bridesmaids wore peachy pink corseted tops and cream, tulle full -length skirts, carried dainty sleeping flower posies and wore flower hair clips. 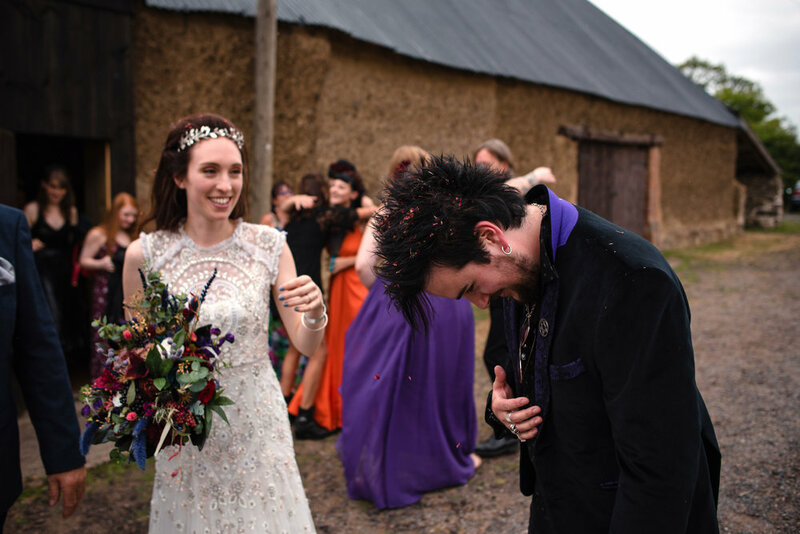 The result was a spectacular array of colourful dried blooms that made the day extra special. 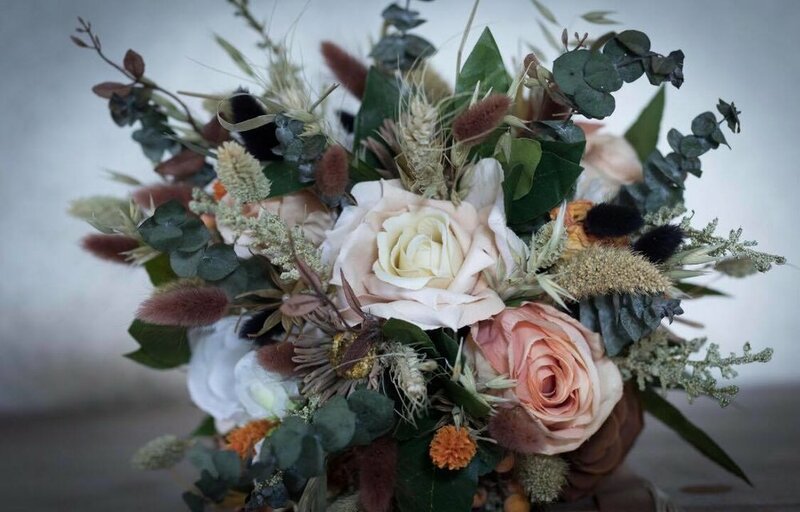 We used a variety of peach and pink dried and miniture silk roses with two tone hues and matched these with a variety of spectacular dried grasses and herbs, lepidium, nigella, and tiny seed pearls and crystals! Thanks to John Hesford Photography. 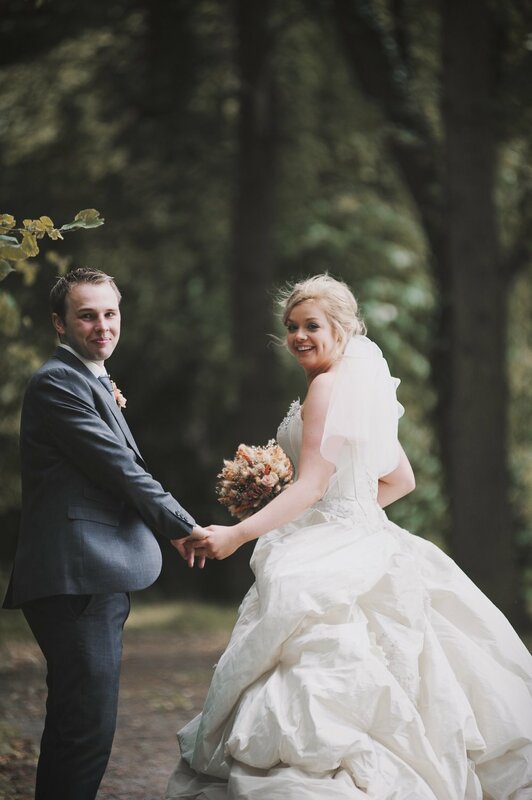 Amy and Scott were married at the beautiful Jacobean mansion, Inglewood House, a wonderful, romantic venue in Stirling, Scotland. 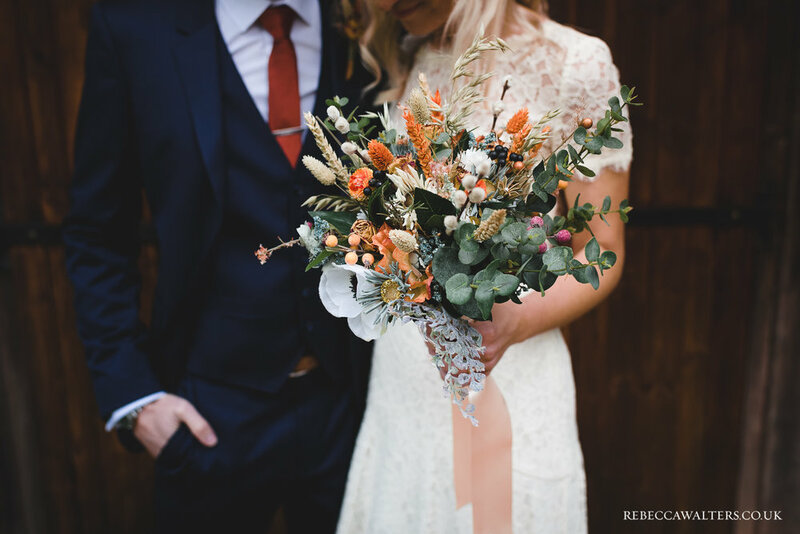 Amy chose a stunning, boho country style wedding bouquet with silk and dried coffee, cream and peach flowers, a wide variety of beauiful grasses, seed pods and tiny seed pearls all finished off with palest peach silk ribbon ties. We also made Amy a matching flower crown, bridesmaid bouquets, men's buttonholes and venue table centre decorations for the big day. The Sleeping Flower Company want to thank Amy and Scott for being our customers. 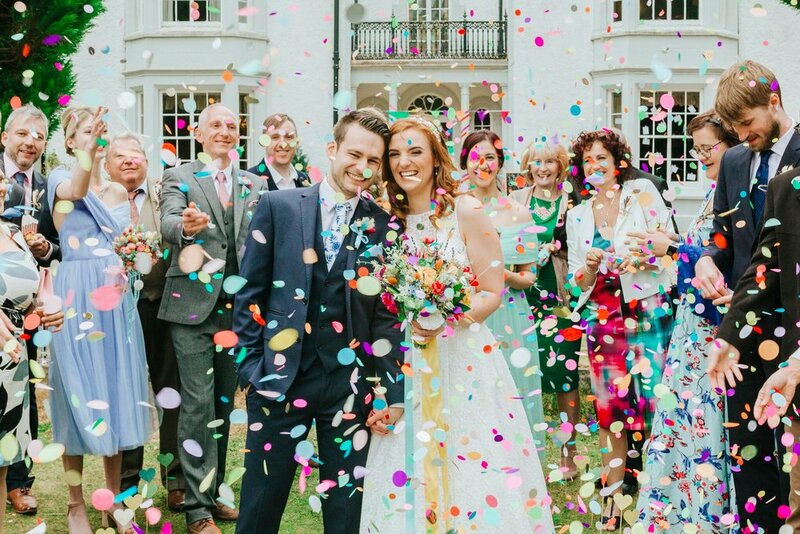 We think that your wedding looked totally spectacular! 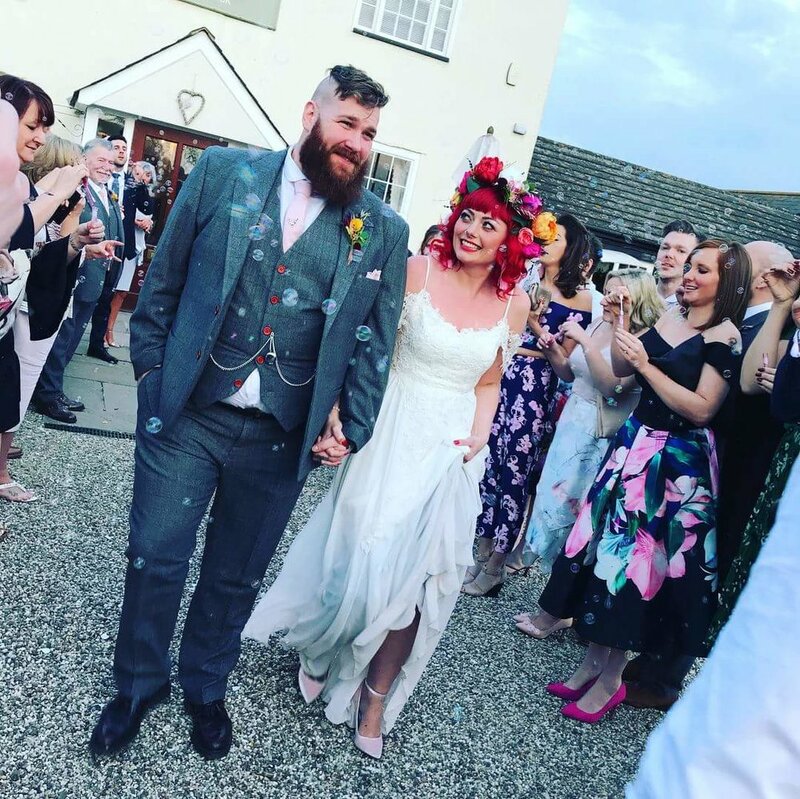 "I honestly cannot recommend Julie and the sleeping flower company enough - anyone planning a wedding or event and wanting beautiful flowers that will last way beyond the day take a look and some of the pictures of their work on the website, Facebook and Etsy... the pictures are very true to what you get- there’s no nasty surprises!" 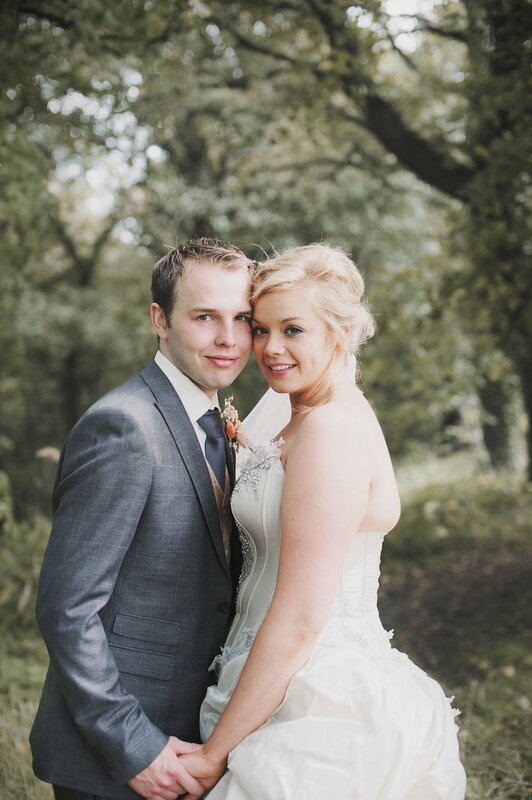 Amy and Ed got married in February at Fazeley Studios in Birmingham’s creative quarter. 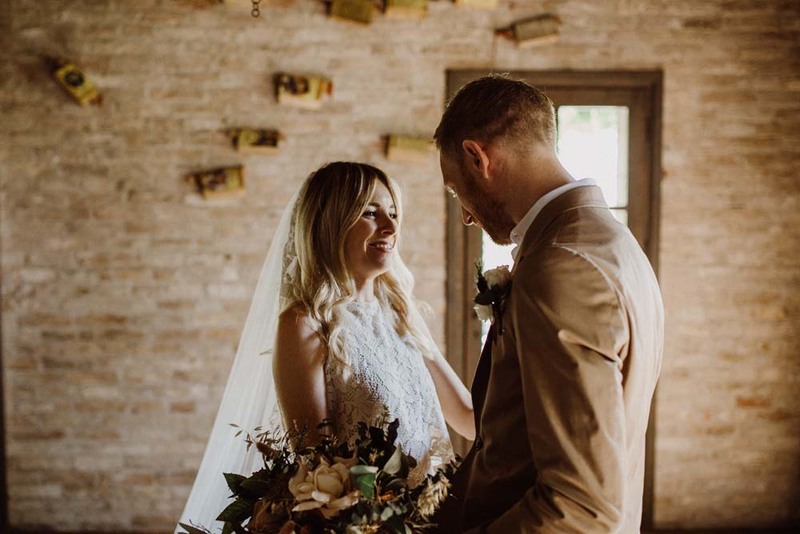 From the elegant grandeur of a renovated 19th century chapel to the versatile blank canvas of the converted factory spaces, there is no more perfect place to host your wedding! They chose a stunning floral colour palete of Ruby reds and hot pinks with a touch of black to match the bridesmaid dresses. 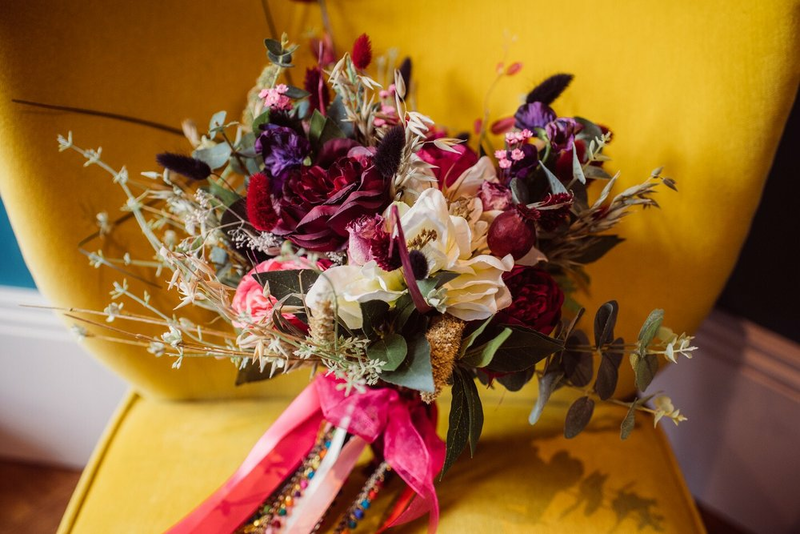 The Sleeping Flower Company put together a spectacular array of florals in their chosen colours, including cabbage and peony roses, berries, anemone, eucalyptus, setaria, wheat, oats and a variety of seed pods and other gorgeous fillers. 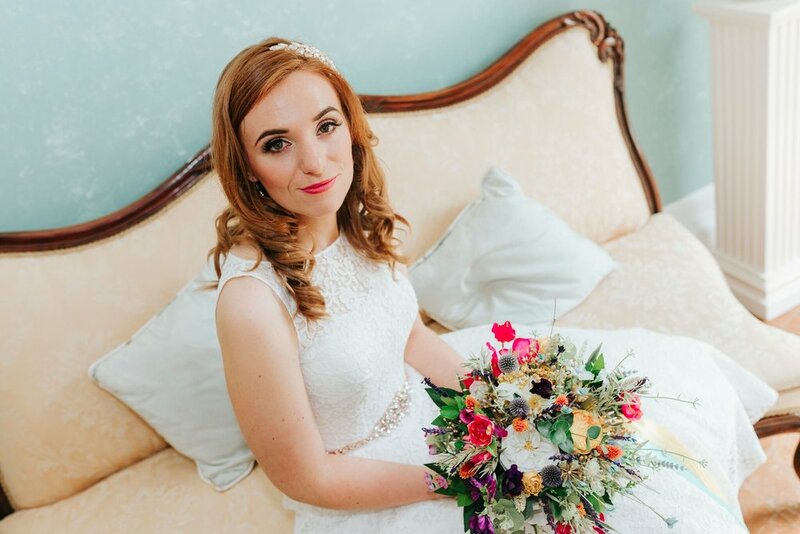 The stunning colours were offset by the wonderful black bridesmaids dresses and the bride's beautiful, cream wedding gown. Simply Spectacular! 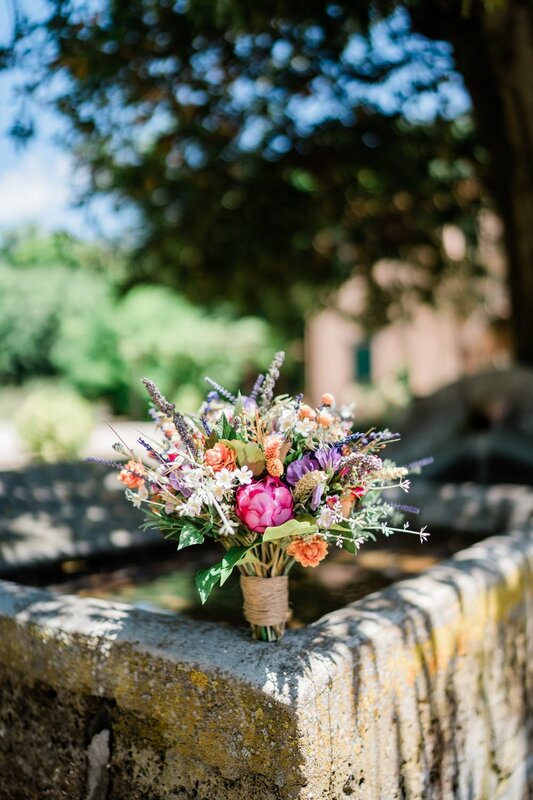 Sarah and Ric held their wedding ceremony and reception outdoors in the Italian sunshine at the wonderful venue of Locanda Rosa Rosae. 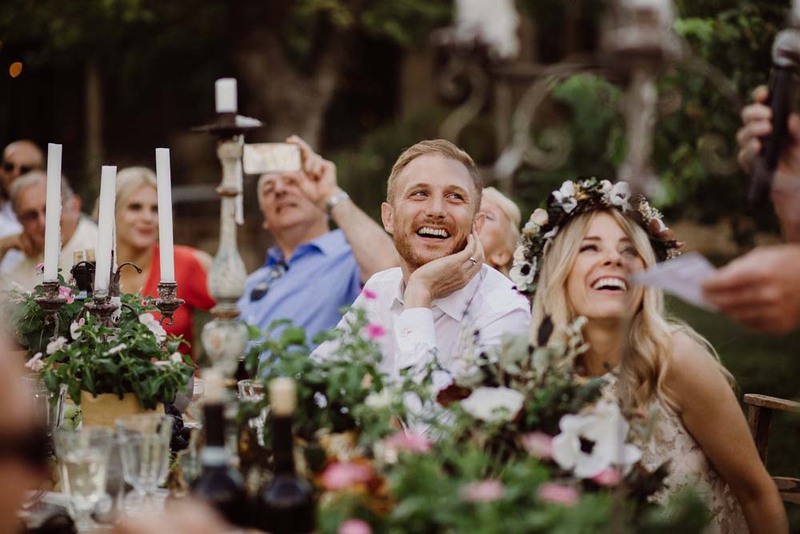 They said their vows in front of a small group of family and friends, amongst an array of beautiful flowers, potted herbs, fresh fruit and candelabras – the result was nothing short of perfect! After much research on local florists in the area, I decided to have my flowers shipped to Italy. I found The Sleeping Flower Company based in Durham and they did an amazing job at matching the style of flowers that I wanted. I was quite particular about the details, not to mention changed my mind a few times, but Julie was so good at understanding my vision. She makes her bouquets and arrangements with silk and dried flowers and foliage. Admittedly, I was a little apprehensive that they could look ‘fake’, but when I saw them I was absolutely blown away at how beautiful and realistic they looked. And the great thing is that I can now keep my wedding flowers forever! One final thing! 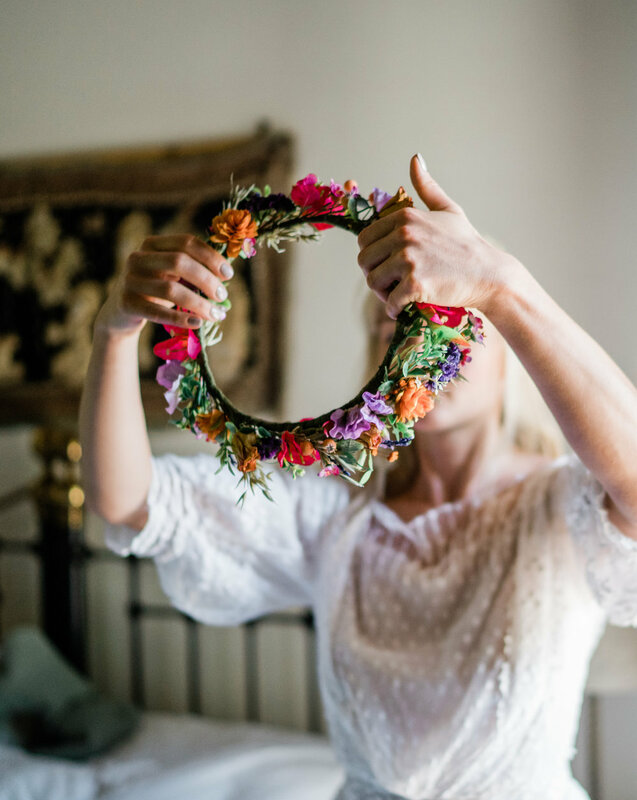 Sarah has her own hand poured candle studio and creates beautiful personalised candle wedding favours If you’re looking for a wedding favours with a difference, then do get in touch with Sarah at Evermore London’s candle favours. To see more photos, click on the carousel below. 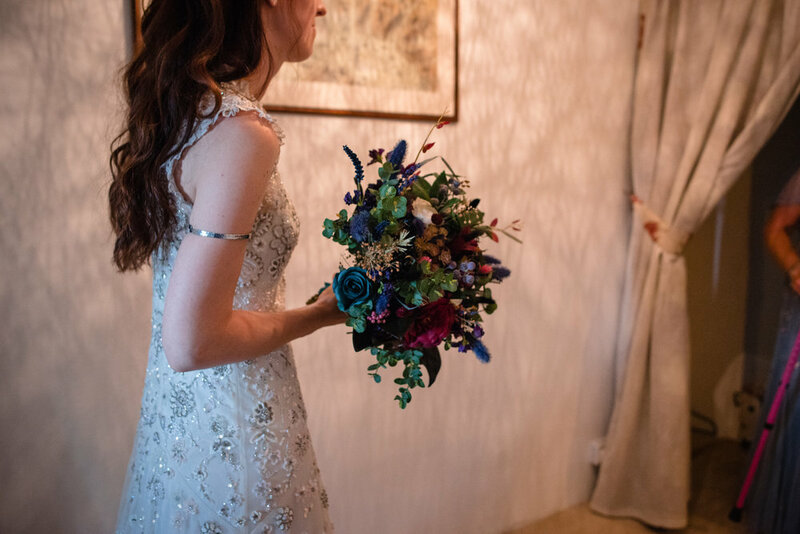 "Thank you again so much, the flowers were just perfect and really completed the day"
The spectacular gardens at the London Wetland Centre in Barnes provided a stunning and inspiring backdrop for this October wedding. 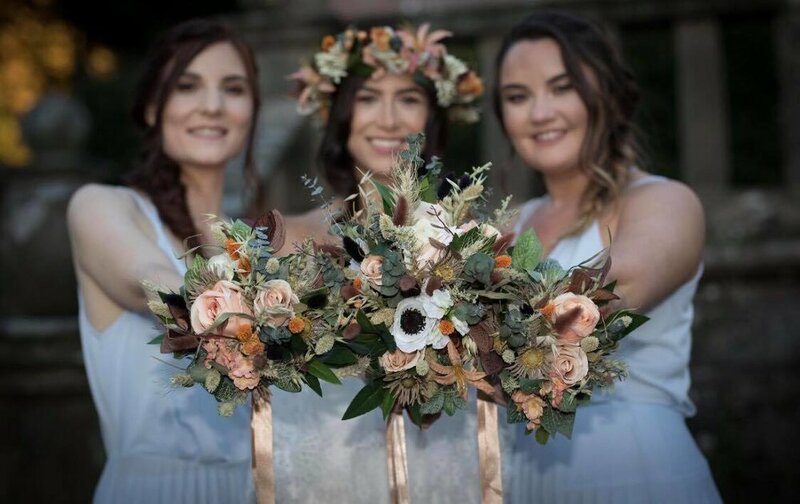 The Bride chose a selection of dark golden roses, white anemone, meadow grasses and berries with hints of orange, peppermint and pale blue, all nestled in a bed of eucalyptus and bay leaves. 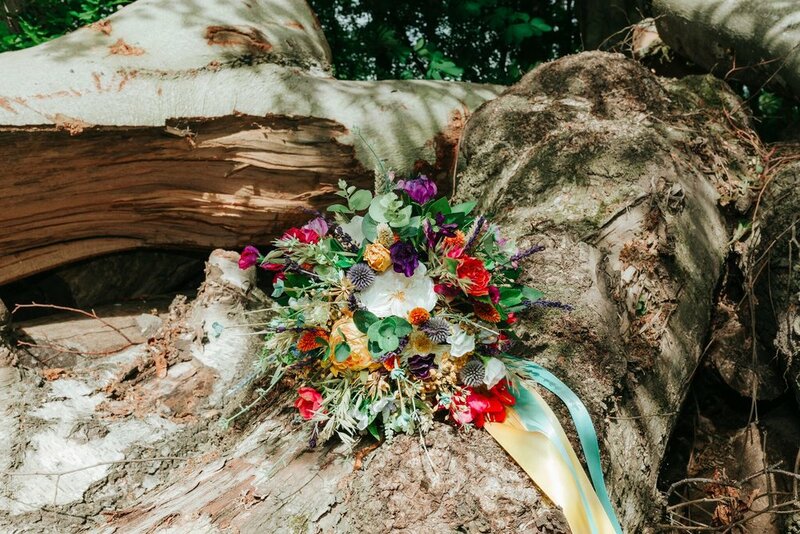 With matching floral hair clip, buttonholes and table flowers everything came together perfectly! 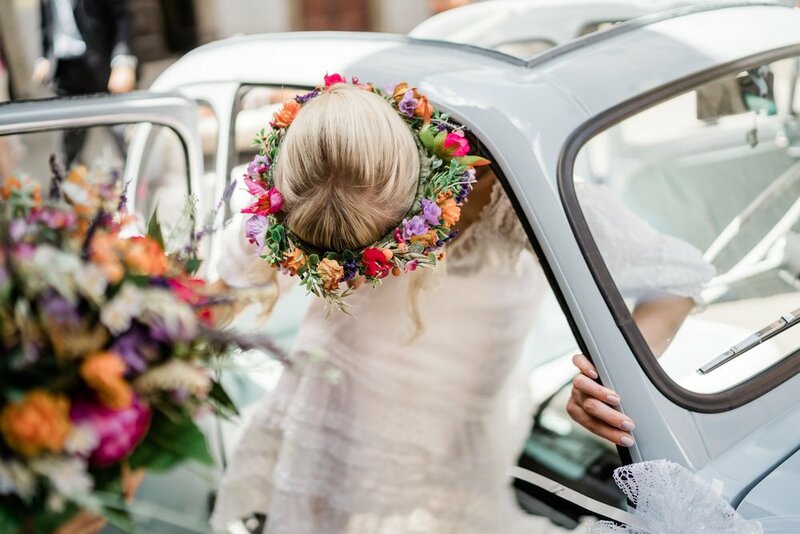 The Sleeping Flower Company says: We loved being a part of your day! Thank you so much for choosing us! Our new Etsy shop is open. Take a look and let us know what you think. Lots of things to buy - and remember- anything can be made in whatever colour you like. So nice to be back at Crathorne Hall for a busy wedding fayre. Exciting times! Today is a special day as our new Sleeping Flower Co. workshop is almost ready! 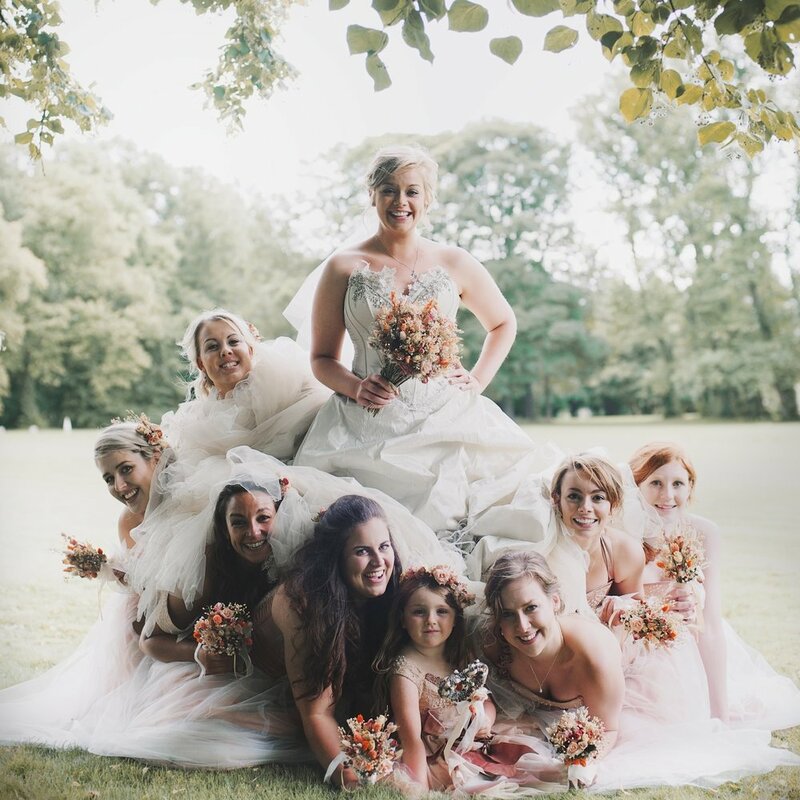 Sam and Kat held their wedding in Helmsley Walled Garden in North Yorkshire. Papakata teepee tents set against the beautiful backdrop of Helmsley Castle, stunning flowers and perfect weather. This truly was the very best spot for a wedding!